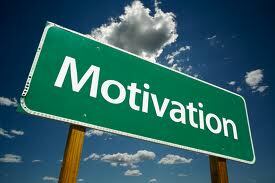 Often many find the hardest part of a project is finding the motivation to begin. When feeling overwhelmed with clutter, it may seem impossible to start. Even organizing one drawer, one day at a time may seem pointless at first. Organization has to start somewhere, and even doing the smallest things can have huge impact. Below are tips to help motivate you to being organizing your home. Just do something – I often find that if I start with something I immediately feel better. It doesn’t have to be huge, a small drawer, your purse, your front hall closet are all excellent places to start. Reward yourself… often! – It makes it more fun. Make a reservation at your favourite restaurant; buy a nice bottle of wine or maybe a movie night with the kids. Get the kids involved too and they can create their own rewards. Set a timer – Don’t set an infinite time limit on your organizing session. Start small, 15 – 20 minutes and then from there you can build on the time you spend organizing. Get other people involved – Have an organizing party with family or friends (maybe you have a friend that loves to organize). Invite them over, turn on some music and make your favourite snacks to create a fun atmosphere. Set a dinner date – I find that when I have a deadline, I tend to work harder to achieve my goal. Throw a house party or plan a special dinner for your nearest and dearest. You can include them in the celebration or just keep it to yourself and marvel in the work you accomplished! Organizing doesn’t have to be tiresome; it can be fun and rewarding. All it takes is a little bit of motivation like a deadline to get the ball rolling. Happy Organizing! Are you tired of buying something only to find it hidden away in the back corner of your cupboard? Or what about finding that one cookbook with that delicious cheese cake recipe? The kitchen is the heart of the home, filled with life and activity. If it is not set-up properly it can turn cooking into a hassle. A well-organized kitchen will help to keep the days running smoothly. Evaluate everything in the kitchen – How many sets of silverware or colanders do you need? How much are you really cooking and are you holding onto things because you feel you need to? 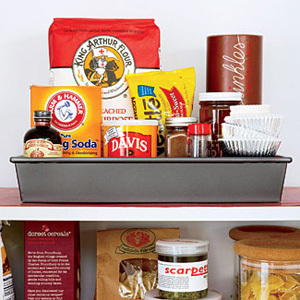 Organize your kitchen into zones – cooking zone, baking zone, storing zone, serving zone. Organize the cabinets around the zones with the items you’ll need in each. Zones will increase the flow of the kitchen, which will in turn increase the function of the kitchen. Put together ready to go kits of things to cook or bake regularly – if you make cookies a lot, put all the ingredients you use (non-refrigerated items only) and store them in the cabinet together. When it’s time to make cookies pull it out and quickly whip them up, same goes with soups, pasta, and breads. Last, but not least, buying in bulk isn’t always the answer if it’s taking up a lot of room and not necessary. Hopefully the above tips will help to make dinner and meal times a breeze. It’s September and the kids are back at school! The rush hour traffic is back at full volume, meaning it is more important than ever to have a smooth morning routine. Nothing is worse than realizing at 8:15am that there are no juice boxes for lunches and a pen cannot be found to sign that late permission form. Homework station – Fill small plastic drawers or bins with everything you need to work through household paperwork or your child‘s homework, pencils, ruler, calculator, colored pencils etc. Simply put it away when you’re done for a portable work center. Put a calendar on the fridge – Layout the family‘s schedule so everyone knows where to be and when. You can also easily schedule activities for the family without having to consult with everyone first. Packing Lunches – Place a bin in the fridge with all the lunch items you’ll need to pack your child’s lunch. Take the bin out in the morning or the night before to pack the lunches. You’ll also know right away when things need to be restocked. 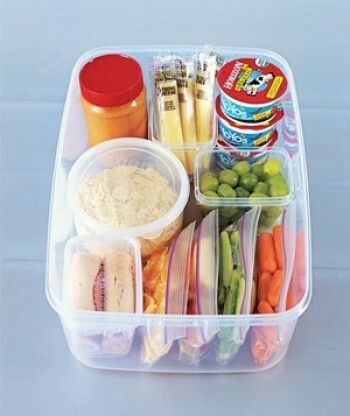 Pre-portion Snacks – Pre-portion your child’s favorite snacks in portable containers. They can pull them out after school or you can grab them quickly and go on the way to after-school activities. Managing Paperwork and Art – We want to treasure our little one’s masterpieces, but it’s simply not possible to keep everything. I recommend getting a bin, under the bed bins work great, and fill it up with art projects and school papers. Go through this at a preset time. Once a month is good or once a quarter. Decide which pieces to keep and take pictures of the others. You can keep an unlimited digital archive for memories. Hopefully the above tips help to ease the transition from a summer of fun into a successful school year. Happy Organizing!